The Tennessee-based Bray man opened with a level par 72 in the Qualifying School finals at TPC West in California. And that left him in a massive 20-way tie for 24th place in the 163 man field - just inside the top 30 and ties who get their cards. Nolan opened his card bid on the easier Jack Nicklaus Tournament course where American Scott Gutschewski shot a five under 67 to take a one-shot lead over Jeff Gallagher and Ryan Howison. Gallagher and Howison also played the Jack Nicklaus Course which played more than two shots easier than the feared TPC Stadium Course. Just two of the top ten played posted their scores on the more difficult Stadium lay-out with Aussie Paul Gow and American Kenneth Staton firing two under par 70s. Nolan knows that the Q School is all about keeping a big number off your card and his 72 will have done wonders for his confidence. But it wasn't all plain sailing for the bigger names. Two-time US Open champion Lee Janzen, who is back at the school after finishing 147th on the money list, hit a one over par 73 at the Jack Nicklaus course. At the Stadium Course, Germany's Alex Cejka had to settle for a two over par 74, Bob May a 76 and Carlos Franco a six over par 78. 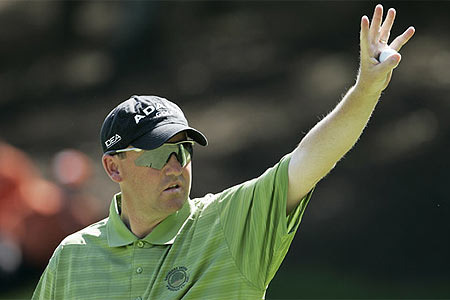 But it was even worse for American Chris Riley, who severely criticised for saying he was too tired to play twice in one day at the 2004 Ryder Cup. Riley crashed to a nightmare 83 and to lie 159th after the opening round.